Leap Motion’s 3D gesture control technology has already been integrated into a laptop, but next year it could find its way into a new generation of touchless smartphones and tablets. Speaking to The Next Web, company CEO Michael Buckwald claimed the first Leap-integrated mobile devices should launch in the second half of 2014. According to Buckwald, the challenge of fitting Leap’s technology into smaller devices has already been solved, though there are still a few remaining steps before these new products are ready for mass release. The company didn’t reveal whether it’s working with any specific manufacturers or partners at this point and doesn’t have a public roadmap. Clearly Leap Motion has something in the works, though, if it’s predicting a launch as soon as Q3 2014. While Leap Motion has obvious implications for mobile games by replacing on-screen controls with touchless gestures, the company has bigger plans. It envisions the technology turning the space directly above a device into its own interface—especially on larger tablets—to create a 3D experience, allowing the user to control multiple integrated screens around the room. In the next few years, Leap hopes to see its technology used in “future TVs, head mounted displays and even things like cars” as its capabilities continue to grow. 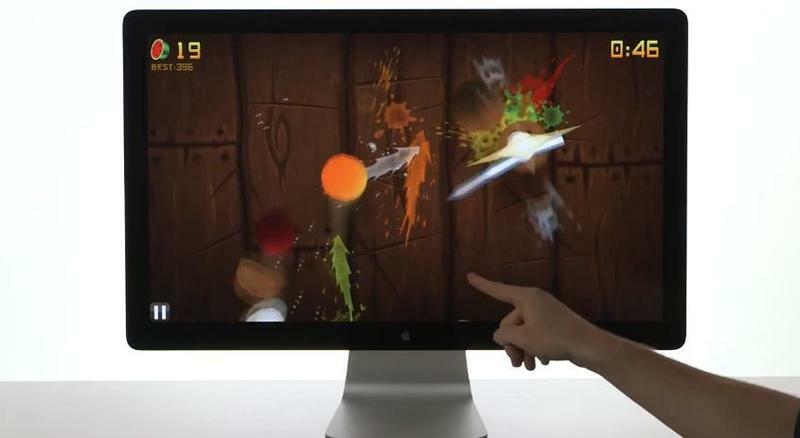 That all sounds awesome and futuristic, though for now we’re just as excited at the prospect of playing Fruit Ninja without ever needing to touch the screen.